On July 11, 2016, the seventh tanker of Project RST54, Balt-Flot 6, built by Okskaya shipyard (Hull No 5407), was put into operation, says the shipyard. It is the sixth ship of Project RST54 built by Okskaya Shipyard for Balt Flot Tanker (BFT, Saint-Petersburg), says the Project designer Marine Engineering Bureau. Krasnoye Sormovo Okskaya shipyard and BFT signed a contract for construction of 5 vessels including two RST-27 and three RST-54 tankers in September 2015. The contract involving State Transport Leasing Company (STLC PJSC) was signed in the framework of NEVA-2015, the International Maritime Exhibition and Conferences of Russia. The vessel has been built under the contract signed by BF Tanker on September 23, 2015 for construction of 7 sea/river type tankers at Krasnoye Sormovo (United Shipbuilding Corporation) and Okskaya Shipyard (UCLH). 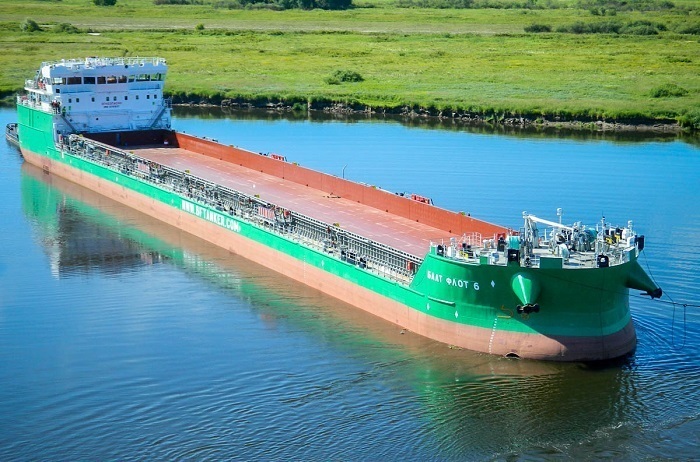 Under the contract involving State Transport Leasing Company (STLC PJSC), the company is to get three RST-54 tankers (combination bulk oil / deck cargo carrier) and four RST-27 tankers. Okskaya Shipyard will build 5 vessels (two RST-27 tankers and three RST-54 tankers), Krasnoye Sormovo - two RST-27 tankers. All the vessels are to be delivered in 2016. Okskaya Shipyard has built three tankers of Project RST54 and two tankers of Project RST27 (the first of them was launched on June 8, 2016). Two tankers of Project RST27 has been built by Krasnoye Sormovo shipyard. Okskaya Shipyard is going to deliver the forth ship of Project RST54 on August 25, 2016. RST54 project vessels of Volga-Don Max class meet the dimensions of the Volga-Don Ship Canal and Volga-Baltic Waterway. LOA - 140.85 m, beam - 16.6 m, depth – 6.0 m. Class of the Russian Maritime Register of Shipping - M-ПР2,5 (ice30) А. Crew - 12 persons (14 places + pilot). Sea endurance - 20 days. Okskaya Sudoverf (Shipyard “Oka”) based in Navashino of Nizhny Novgorod region was founded in 1907. The modern Okskaya Shipyard JSC was established through privatization of the state enterprise Navashino Shipyard “Oka”. The firm specializes in building multipurpose river and sea going vessels, container carriers, special ships, barges. The company’s major shareholder is Universal Cargo Logistics Holding B.V. (UCL Holding). UCL Holding is an international transportation group consolidating a number of Russian shipping, stevedoring, shipbuilding, railway and logistic companies. The division also includes Volga Shipping Company, V.F.Tanker, several cruise and shipbuilding companies.